Finally...I Can Start My Summer Reading! We've only been out of school for 23 days, but I've already held an ice cream social graduation party for Steven, escorted two groups of kids, 91 in total to Boston and helped my parents move. I haven't had much time for reading, but now it's time to get serious about this reading thing. I was able to read Killing Kennedy on the first trip and Hero on a Bicycle on the second, but a bus load of kids doesn't really make for an ideal reading environment for me! Now things are set, nothing on the calendar between now and August 10 when we move our son into the dorms at Ball State in Muncie, Indianan. Here's my plan. Usually I read the reviews in School Library Journal and place reserves at the public library but a Kirby Larson post on Facebook changed my plan. Her book Hattie Ever After has been nominated as one of the notable books for 2013 by the ALSC. I looked at the list and thought this would be a great place to start my summer reading. I'm going to see how many of these books I can read in the coming days and I'm also going to do my best to post about my findings. I've been a bit lazy and slack of late and I'm going to try to fix that starting with this post. As I looked over the list, I'm proud to say I've 11 of the 19 picture books, many of them already purchased for the Bailey library. I'm only able to cross over 3 of the fiction books and don't even get me started on the non-fiction, actually, that's exactly what I need to do, get started on the non-fiction! It's Monday, Mrs. Jolly Bones by Warren Hanson was a hit in THE PIT this year. It's fun rhymes and ridiculous situations made for some good laughs. As Mrs. Jolly Bones goes through her weekly chores things seem normal until she adds her own surprise, wacky twist to finish each job. The pictures by Tricia Tusa are colorful and fun to look at giving the kids new things to see each time they read the book. 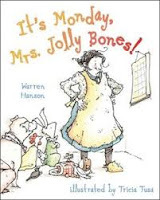 What fun way to teach the days of the week, maybe even coming up with some extra chores for Mrs. Jolly Bones to complete. So there you go, I know it's not much, but it's a start. I'm off to the library to see if any of my reserves are in! Thoughts about All Write - Slice of Life / Teachers Write! I read Tony's piece and Ruth's piece reflecting on All Write, and I loved how they did such a wonderful job synthesizing the main concepts of our two days together -- in one case, the paths our own learning takes and in the other, the notion of security. I loved what both Tony and Ruth had to say, and they inspired me to reread my notes several times to capture the essence of what Chris Lehman, Carl Anderson, Jeff Anderson, Ruth Ayres, Penny Kittle, and Lester Laminack all shared. One of the topics I wanted to investigate more was research. Chris Lehman talked about revising our research notes -- spending time revising and rethinking about the things we have learned. So, I decided to put his words into action. 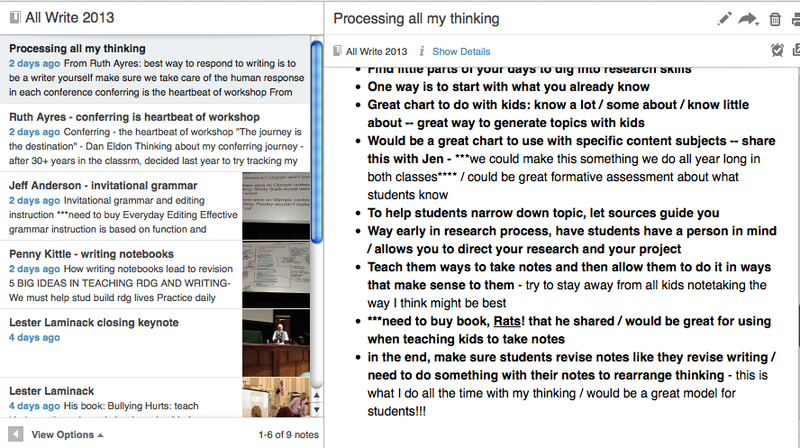 I pulled up all the ideas that I had captured in Evernote, and then began a new note - one titled, "Processing". It was here that I did my revising (see screenshot). To use his words, by completing this exercise, I rearranged my thinking about what I heard at the conference. I was able to whittle down some of my notes from speakers and try to crystallize their main points. Other times, I was jotting down reflections about a quote from someone that really got me thinking. What a powerful learning tool this was for me. I listened to Penny Kittle in several sessions, and she clearly shared the importance of teachers sharing our own writing and writing process with our students. That's not why I did the revision and rethinking of my original notes, but it will certainly be a side benefit. And I truly can't imagine not engaging in this practice when doing any type of research again. It truly did help me clarify my thinking. As I work on writing projects in the months ahead, I think revising my research will be a strategy I come back to time and time again. 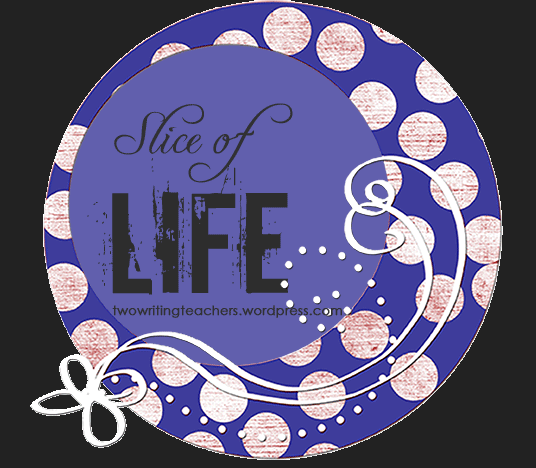 Other slices can be found at Two Writing Teachers, Ruth and Stacey's blog, the blog that inspires us all to be here. Thanks so much to both of these wonderful women for providing us yet one more format in which to write! That second part is what I want to talk about first. OMG!! 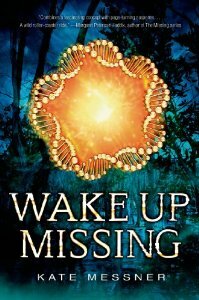 I loved the mystery and adventure that Kate had put into her Capture the Flag series, but she took writing a page-turner to an entirely different level with Wake Up Missing. Granted, the target audience might be a bit older (5th grade and up, probably), but the possibility of DNA engineering, chases through the Florida swamps, alligators lying in wait, made this a book I could not put down once I began. I find it lovely when one author pays respect to another in a book. In a very subtle way, Kate Messner gives a nod to Laurel Snyder and her book, Bigger Than a Breadbox -- it is mentioned several times as the book the narrator is reading, but it is cleverly done. The book is never mentioned by name, but if you know the book, the descriptions of the plot line make it very clear (reminiscent of how A Wrinkle in Time is referenced many times without its title in When You Reach Me). Put September 10 on your calendars right now or get this book pre-ordered, especially if you teach 5th grade or middle school. Wake Up Missing is not to be missed! 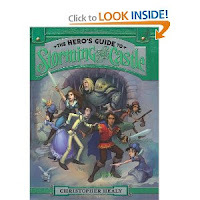 The other book I finished this weekend is The Hero's Guide to Storming the Castle. Our heroes are in trouble again, especially Liam, and it takes the entire group and their combined strengths (though some of their "strengths" are hysterical!) to persevere. A perfect follow-up to The Hero's Guide to Saving Our Kingdom. I also had to read The Great Santini by Pat Conroy for one of my adult book clubs this week. I normally love everything this man has ever written, but am having a very difficult time with this book. I have to be very invested in the characters of the story, and there is one character in this book I just can't stand. I have about 75 pages left to read before Wednesday, so I'm hoping something turns around in how I view this man. But, I have to say, Pat Conroy can really develop a character and a setting, and that is equally true in The Great Santini. have 6 choices from the public library for my next adult read; not sure which one will be "the one"
I knew this was a summer that I would be reflecting and thinking about life, my teaching, my learning, and a multitude of other topics. So, when I began to see the first promos for #TeachersWrite online I knew I wanted to take part in it this year. As I looked at the guidelines, I realized I might not do every activity, but I will participate in as many of the prompts and lessons as I can. I am personally determined to become a better writer. By better writer, I don't necessarily mean someone who writes with the most eloquent of language. Instead, I want to be a better writer by writing each and every day. I just returned from the fabulous All Write conference, and one presenter after another shared the importance of being a writer if you plan on being a teacher of writing. I knew this, but it was wonderful to have that particular message driven home time and time again in a two day period. I am just coming off a huge drought of non-writing. I missed the community of writers and I missed putting my ideas down into a format, but as one day after another passed by, I got less and less ambitious about tackling writing. 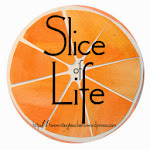 I will not be writing here at Literate Lives, though I will be sharing some of my writing publicly through a new blog just for me called Karen's Thoughtful Wanderings . 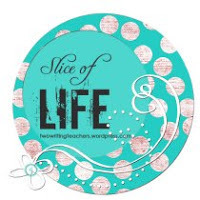 On Sundays, I hope to reflect back on my week and share some of the triumphs and some of the struggles here, but the rest of the week will be at the new blog. You will be able to find me through TeachersWrite if you'd like to visit. Today, and the rest of the Sundays through the month, visit Jen Vincent's blog to see the reflections of other writers as well. Will they sleep through the night? Will they make friends in school? How could we not have known she needed glasses so badly? Will she make the team for which she tried out? Will she get the part she wanted for the recital? Will they be safe as they learn to drive? What do you mean you ran over the calming device and got a flat tire? Are they safe at school? Will she be safe in the big city in which she has decided to move? I was so excited when I was catching up on twitter and blogs, and I saw that Cathy had posted an all-call for people to post pictures of what they want to read professionally this summer. Better yet, I hadn't even missed the deadline for this. Pictures were to be posted on Wednesday, June 12, and decisions about which book to think about together this summer would happen after that. Count me in!!! I love this summer PD. The first year, we read and chatted about Patrick Allen's book, Conferring, the Keystone to Writing Workshop. Then last year, we read and chatted about the wonderful words and messages in Opening Minds by Peter Johnston. Great stuff, right?!! I anxiously look forward to what the #cyberPD choice will be. Chances are I may be adding yet another book to my professional TBR pile. Stay tuned!! For more #cyberPD bookstacks, head on over to Cathy's blog to see the round-up. 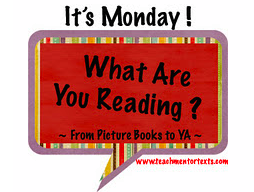 I'm back for It's Monday, What Are You Reading!! I recently read Ann Marie's blog where she talked about leaving blogging for a while, but now she's back, and the same is true for me. 2013 has been a rough year for my family, but I'm happy to say that life is on an upswing right now, and I actually want to write again. I have truly missed both writing and the community of people I am connected to because of our blogs and our thinking and sharing. Thanks for being so patient with me. In my two language arts classes this year, humor, adventure, and series books were quite popular during independent reading time. So, when both Susan Dee and Tony Keefer recommended this series to me, I knew I had to read it. 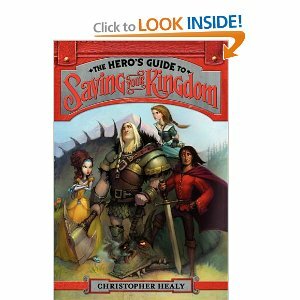 I just finished The Hero's Guide to Saving Your Kingdom by Christopher Healy. Humor, adventure, and some great fairy tale mash-ups abound in this book. 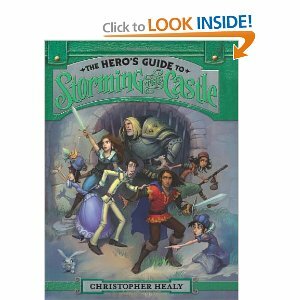 The second book just came out - The Hero's Guide to Storming the Castle - and it is high in my TBR pile right now. I'm currently thinking that the first book might be one of my early read alouds next year. Someone recently told me that she thought the fastest way to connect people is with laughter, and if that is true, The Hero's Guide to Saving Your Kingdom would be great for connecting our reading communities at school. 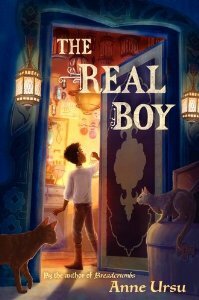 My next read is The Real Boy by Anne Ursu. I tried to read this in May while my mom was in the hospital and I just couldn't focus; I stopped at page 122. Then, I read on twitter that Colby Sharp thought this book was amazing, and I realized I had to give this book another try. So, I began again last night, and already, I am seeing what I missed and what an incredible book this is. This is exactly why some books need more than one chance. Thanks to Colby for unwittingly getting me restarted. My one adult book club selection I'm currently reading is an oldie but goodie by Pat Conroy, The Great Santini. I love Pat Conroy, and this is one of the few books of his I haven't yet read. Because most of his books are set in the south, I'm assuming this will be as well; it's like taking a mini-vacation there without ever leaving my screened porch. And this man knows how to develop characters as well. I can share more next week, as I'm reading this book right after The Real Boy. I haven't addressed my professional reading yet, but I am saving that for this Wednesday, June 12, when the wonderful ladies who organize summer #cyberPD are having us "reveal" our summer professional reading stacks, and from there, they will try to find a book that many people already have on their radar, and use that book for the #cyberPD this summer. If you've never participated, it is wonderful to read and respond to everyone's reflections about the same thing you read. I highly recommend it. Check out the lists in 2 days! !